"That was but a prelude; where they have burned books, they will ultimately also burn people. "German original Das war ein Vorspiel nur, dort wo man Bücher verbrennt, verbrennt man auch am Ende Menschen. — Heinrich Heine, from the 1823 tragic play Almansor. How do you show that your Police State is monstrous and trying to stamp out all free thought? Or that your Moral Guardians have crossed the line into Culture Police? Have 'em hold a good old-fashioned book burning! 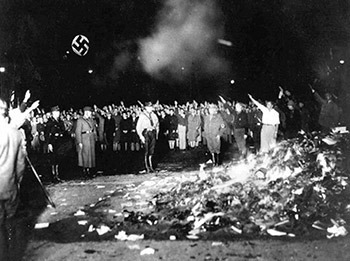 The Book Burning is exactly what it sounds like: the incineration (preferably a big bonfire) of literature that threatens the government's authority or the Moral Guardians' values. It's Kill It with Fire used for censorship, or at the very least to make a statement. It doesn't have to be books — movies, music and artwork may also go on the fire. It doesn't necessarily have to be burning, either — dumping the books into a wood chipper or into the sea sends the same message. Since Most Writers Are Writers, they usually have pretty strong feelings on this subject. (Booksellers often have different, somewhat conflicted, feelings. If someone's buying armloads of books from your store, their intent to burn may not concern you much. Then again in totalitarian states they may not need to buy them in the first place). It's worth noting that, while the emotional impact of burning books hasn't changed with the digital age, the physical impact of trying to destroy books is largely mitigated by mass printing and e-format books. Often goes hand in hand with Persecuted Intellectuals and You Cannot Kill An Idea. Compare Break-Up Bonfire, which carries a more personal meaning. Not to be confused with the Burn Book. Related to the real life event, Bonfire of the Vanities, but not to be confused with The Bonfire of the Vanities. Alternatively the trope can be used in a non-political manner; a group of survivors from an incident may have to burn books just to keep themselves warm. In one episode of Fullmetal Alchemist, the homunculi burn down one section of the library to stop Edward from getting information on the Philosopher's Stone. The ROD TV series had the British Library burning books that would not fit under their new "unified culture," though the immediate motive seems to have been getting the goat of the bibliophile heroines. Library War is all about Japan's libraries trying to save what books are left from the Media Betterment Committee and their bonfires. In One Piece, this figures into Nico Robin's backstory with the Marines raiding the Ohara Library prior to unleashing the Buster Call that would eradicate Ohara. The primary motive is more practical than usual—they were trying to destroy any blueprints of a Weapon of Mass Destruction—but they were also furthering an unknown period of time the World Government wants to keep buried. In Kirby of the Stars, King Dedede burnt all the Pappy Potter and the Fool's Stone copies in Pupu village and made it illegal because he's illiterate and cannot read the novels at all. The Jack Chick tract "Dark Dungeons" famously ended with a bonfire scene that had people burning their Dungeons & Dragons materials (as well as other things considered religiously objectionable). In true Chick fashion, this is one of the few examples where the burning is presented as a good thing. One of the Big Bads of Jack of Fables is named Bookburner. It is a Meaningful Name. The Gray Smurfs in The Smurfs comic book story "The Smurf Menace" burn all of Papa Smurf's spell books in order to keep him from finding the spell to make the Gray Smurfs vanish. Scott Adams, on the other hand, gleefully takes the bookstores' more positive point of view in one of his books, offering to chip in a few bucks for markers and protest signs for anyone who finds him offensive, as protests and burnings will encourage bigger sales for his books. Once Darkseid takes control of most of the Earth in Final Crisis, his Justifiers hunt down and burn Earth's literature, claiming that "What disagrees with Darkseid is heresy; What agrees with Darkseid is superfluous." One part of the story (Submit #1) shows Black Lightning (a teacher in his civilian identity) rescuing the Tatooed Man's family, and berating them for burning books to keep warm; the last pages shows an Anti-Life converted Black Lightning throwing a book he rescued earlier onto the flames himself. In Secret Empire, once HYDRA has taken control of America, they destroy the history books to be replaced with those more aligned with HYDRA (specifically Steve Rogers' point of view). An issue of Deadpool has HYDRA soldiers busting into a comic book shop and destroying issues of Captain America's first appearance, the one that has him punching Hitler in the face. One of the more ridiculous aspects of the Ron the Death Eater treatment given to Princess Celestia in Frigid Winds And Burning Hearts is the mention, in a casual, offhand manner, that she - a ruler who, canonically, maintains a giant library with a wing named after one of the great scholars of antiquity - has a bureau devoted to burning books she finds objectionable. The Stalking Zuko Series has Firelord Sozin, who kept many original documents and scrolls that he raided from invaded areas and burned everyone else's copies. Also, Zhao's burning of the Fire Nation section of the Wa Shi Tong's library is seen while practical is very unusual. The Celestia Code has Twilight doing this in order to ensure Sombra's plan to kill Celestia doesn't happen. In the A Song of Ice and Fire story Wearing Robert's Crown the High Septon argues in favour of this for a scandalous new book hot off the presses. Jon Arryn notes that Robert Baratheon isn't inclined to ban books. It's later indicated Robert wrote the book himself. The Pieces Lie Where They Fell: A rare positive example (at least, it starts that way) in the sequel Picking Up the Pieces, as the former Hatchery griffons, upon being freed from what was essentially slavery and getting their personal information, start a massive bonfire of their Ledgers (the books that kept track of how much they owed the Hatchery), which they no longer need. Unfortunately, it starts getting out of hand, which prompts Wind Breaker and Night Blade to leave the scene as quickly as possible. In Code Geass: The Prepared Rebellion, on top of the typical reasons for this trope, Britannia also had common books burned just because they were written in the original languages of the people of an Area. This policy forces the "Numbers" to learn the language of their conquerors if they want to read anything at all, slowly but surely pushing their native languages into obsolescence. This is especially true for younger generations who attend schools following Britannian educational policies. In South Park: Bigger, Longer & Uncut, the parents of South Park hold a massive bonfire of Canadian media to protest how Canada produced the filthy comics Terrence & Philip. Later, it escalates into rounding up Canadians and sending them to "happy camps", and eventually results in the US invading Canada and starting World War III. The Mortal Storm: Viktor is a Jewish professor still in Germany at the time of the Nazi takeover. The true terror of his situation is brought home to him when he sees a gang of Nazi goons burning books in the courtyard outside his classroom. In The Life of Émile Zola, Zola's books are burned after he intercedes on behalf of the wrongfully accused Alfred Dreyfus. At one point Indy finds himself at Nazi rally where they are burning books. As an archeologist, he can't be happy about it, but he's trying to blend in so he doesn't do anything about it. He does get his father's Grail diary signed by Hitler though. Elsa is in tears at the destruction, but Indy points out she still followed the Nazis willingly. "... goose-stepping morons like you should try reading books instead of burning them!" In Agora, Christian fanatics destroy the library of the Alexandrian Serapeum, toppling statues and columns and burning scrolls of "pagan filth" in bonfires in the couryard. Equilibrium: The dystopian society does this to pretty much any piece of art or literature considered inductive of emotion. They also like to kill dogs for much the same reason. Reverend Shaw Moore in Footloose has a My God, What Have I Done? moment when he sees people took his words to the extreme of burning books. In a key scene of the film Der alte und der junge König (The Old and the Young King), a German Historical film made under Nazi rule in 1935, King Friedrich Wilhelm I of Prussia is shown throwing into an open fire the beloved French-language books of his son, Crown Prince Friedrich (the future Friedrich II), as well as the Prince's flute. The film - banned after the fall of the Nazis as a piece of propaganda making manipulative use of history - presents this book burning as a positive and necessary act, which was needed in order to "educate" and "toughen up" the young prince, so as to "prepare him for becoming a great ruler". Implied in the Stargate backstory. Ra banned literacy on Abydos to prevent its inhabitants from rebelling as their Tau'ri brethren had. The Abydonians manage to keep secret knowledge of hieroglyphics, however. Pleasantville has a scene where an angry mob led by the mayor burns books in reaction to the unwelcome changes in the town. In Twenty-Four Eyes, one book is burned. Ms. Oishi, the Cool Teacher, has been reading a book to her kids in a Japanese fishing village in The '30s, but the book is deemed to be subversive. After another teacher gets thrown in jail for a while, Ms. Oishi's principal confiscates her book and burns it. Non-political variant in The Day After Tomorrow: a few survivors battling the cold hunker down in a massive library. They resort to burning books, but the head librarian refuses to let a Bible be thrown in the mix, not because he's religious, but said Bible was the first book of the library. He also gets into an argument over whether to burn a book by Machiavelli; the argument ends when someone else points out they've got a whole row of books on tax law they can burn instead. In Eric Idle's Beatles parody, All You Need Is Cash, Deep South Christians are seen buying Rutles albums, so as to have more Rutles Trash to burn on purifying bonfires. This parodies John Lennon's unfortunate remark about The Beatles being "Bigger Than Jesus", and the consequent burning-frenzy of "Beatles trash" by outraged fundamentalists. Billion Dollar Brain (1967). The supporters of fervent anti-communist General Midwinter are shown doing this in a montage when he's giving his Motive Rant. A rather atypical example in The Grand Illusion. The Russian prisoners-of-war are so pissed when their care package from the Tsarina turns out to be books, and textbooks no less, that they promptly burn said books. The Uncanny: In "Quebec province, 1975", Joan burns Lucy's books on witchcraft. This is a particularly cruel and heartless thing to do, as the books are one of the few things Lucy has left to remember her mother by. In Jorge Luis Borges's short story "The Library of Babel," the eponymous library contains every possible permutation of letters, all written and bound in books. The implications of this are vast, but one such is that books exist which contain accurate predictions of the future. A fanatical cult views this as heresy and begins burning large sections of the library. Given that infinite near-identical books exist, whose only difference may be a single comma, their efforts are completely fruitless. An unusual example in the Nightfall (Series). Myra burns her own book so that the vampires wouldn't get what they need. She hates doing it because she loves books and considers this the greatest story she has ever written. Prince Vladimir lampshades this and asks her if she knows what kind of people historically burned books. Seeing as The Book Thief is set in Nazi Germany, this comes up a few times and is one of the ways Liesel feeds her reading habit. Ray Bradbury's Fahrenheit 451 is one of the iconic examples of this, set in a world where nearly all literature has been banned and burned. The protagonist is a "fireman", one whose job it is to burn books. And in The Martian Chronicles, "Usher II" alludes to events on Earth where the government sponsored a "Great Burning" of books and made them illegal, which leads to the formation of an underground society of book owners. Those found to possess books had them seized and burned by fire crews. Mars apparently emerged as a refuge from the fascist censorship laws of Earth, until the arrival of a government organization referred to only as "Moral Climates" and their enforcement divisions, the "Dismantlers" and "Burning Crew". Early in Don Quixote, the priest and the housekeeper of the eponymous knight go through the chivalry books that have turned the man mad and, in an act of penance, burn most of them. The comments of the priest express the literary tastes of the author, though he offers some sharp criticisms of Cervantes' own works. He does, notably, save Tirant lo Blanc. However, notice that this example is an Unbuilt Trope: Spain at The Cavalier Years had just discovered the printing press, and books were considered New Media Are Evil. Don Quixotes niece and Old Retainer asked the Moral Guardians permission to do the Book Burning in a desperate attempt to cure him. The Moral Guardians are the most educated people in the village (a curate and a barber), they never wanted to impose their ideas and are doing this as a favor to the family, so they dont care much for this book burning. And a lot of those are really badly written books that destroyed Don Quixotes mind, and the good books were stolen by the Moral Guardian. At the conclusion of the novel Auto da Fe by Nobel Prize winner Elias Canetti, the bibliophile protagonist immolates himself on a pile of his own library. The Japanese novel Toshokan Sensou is about the conflict between two military organizations after the Japanese government passed a law that allows the censorship of any media deemed to be potentially harmful to Japanese society, including book burning. The short story "Earth's Holocaust" from Nathaniel Hawthorne's Mosses from an Old Manse is about a society that burns everything that it finds offensive, including its literature. In Anne of Green Gables, Anne watches in horror as her caretaker burns her book containing the Tennyson poem "The Lady of Shalott" as punishment for reading instead of doing her chores. The first emperor of the Chi'n Dynasty in Ancient China did such an extreme case of this in Breaking the Wall that all the destroyed knowledge actually created a whole new world known as the Land Born of Smoke and Sacrifice. In the Elemental Logic quartet, the Library at Kisha was burned early on in the Sainnite invasion, which is considered a great tragedy. The loss of many books and the country's main center of higher education actually led to the Shaftali losing a significant part of their writing system- the meanings of many of their glyphs (ideographs, used along with an alphabet system or separately as part of a system of telling the future) were forgotten in a short period of time because they were slightly esoteric knowledge to begin with, and no lexicon listing the meanings of all the glyphs survived the burning. A large part of the plot of the third book deals with a time-displaced character stealing a lexicon and hiding it so that the "missing" glyphs can be rediscovered in her present. Septimus Heap has Silas Heap and Alther try to save their book collection from the Custodians, which are rounding up Magyk books in order to burn them. In The Ring of Solomon, a prequel book to The Bartimaeus Trilogy, Bartimaeus destroys a set of of cunieform tablets owned by his evil master, Khaba, in a fit of rage over the fact that another Khaba's servants is about to seal him in a bottle. He then mentions in a footnote that he normally doesn't approve of burning books, "this being a favored pastime of all the worst rulers in history," but the texts of magicians are a special case because they contain the names of spirits by the thousand and thus to destroy them is to limit the opportunities of all magicians to summon other spirits. The Left Behind book series has Bible burning, at least with the furnace inside the giant Nicolae Carpathia statue in New Babylon using onionskin paper found in Bibles. Otherwise, the Antichrist doesn't seem to be doing much to prevent people from reading the Word Of God. In the film Left Behind: World At War, Nicolae Carpathia actually wants people to read God's Word...with shipments of Bibles tainted with anthrax!!! In Small Gods, the theocratic Omnian Church burns books (and people), much to the horror of the Great God Om when he finds out. Deacon Vorbis also orders the burning of the Great Library of Ephebe. It does get burnt down, but not before Brutha stores all the scrolls in his photographic memory. And the person who set it on fire was an Ephebian. Carpe Jugulum has an Omnian priest that has trouble with his faith because he can't help but notice all the little discrepancies in their canon, though he looks to his holy book for guidance. Later he's stuck with a possibly-vampirized Granny Weatherwax in a dark forest, looks to his book for help, and... makes a great light, marking the point in the story where he no longer needs the book for guidance. Wintersmith has a cart of travelling librarians stuck in deep snow and deeper cold. When the Nac Mac Feegle rescuing them point out that there were plenty of books in the cart, the librarians concur, followed by the silence of two people who can't understand each other's point of view. Voices, the second book in Annals of the Western Shore, has the Alds destroy as many books in Ansul as they can. In fact, they invaded specifically to pull down its library and destroy the works therein, although they are strictly speaking "drowning" books (and their owners) in the ocean since they consider fire too holy for the job. In Christian Nation, the protagonist's job in the current theocratic American society is to sort through and destroy books that are deemed subversive to the ideals of the ruling society. In Manly Wade Wellman's short story Letters of Cold Fire, the hero sets (regular, hot) fire to a book of spells written in "letters of cold fire." Justified in that the villain is using the book to try to kill the hero, among other things. In Elizabeth Enright's book, The Saturdays, Miss Pearl the hairdresser tells Mona that her stepmother threw her book in the stove when she was reading instead of doing her chores. The Scream: The "Big Blaze for Jesus," wherein the Moral Guardians encourage teens to bring their records to a bonfire. In the back story of the Rover trilogy, the greatest dark wizard in history burned virtually every book he could find, which is why the forces that fought against him ended up loading a fleet with as many books as they could save and using them to found the library that is the home of the main characters on an obscure, distant island. In the later books it was revealed that said wizard was doing this not to destroy knowledge, but because he was looking for one specific magical book that could grant him mastery of the world - the only thing he knew about said book that could help identify it was the fact that it wasn't flammable. A positive example is mentioned in Storm Warning. Solaris opens her reign as Son of the Sun by ordering every book teaching demon-summoning to be burnt. The Stormlight Archive: One of the reasons that history is fuzzy (besides the Vorin Hierocracy rewriting books to match their dogma) is because Odium and his Unmade spent much of their time destroying historical documents. In one of Dalinar's visions it's mentioned that Yelig-nar broke into Nohadon's chancery and slaughtered his wordsmen, Re-Shephir is found in a destroyed library, and Odium himself blasts Dalinar's copy of The Way of Kings just because Dalinar found comfort in the book. It's to the point that the old Knights Radiant invented a way of encoding information into specially-carved gems in an effort to save as much as they could. In a M*A*S*H episode, Frank Burns does this in preparation for a visit to the camp by General MacArthur, prompting Hawkeye to threaten to "give (him) a dancing lesson in the minefield" if he burns one more book. The books Frank is burning include Plato's Republic and The Life of Red Grange. This is what's about to happen in combination with the witch-burning in Buffy the Vampire Slayer "Gingerbread", when a demon deludes the town's adults into a Witch Hunt and Buffy and Willow nearly get burned at the stake with the books (including Giles Tome of Eldritch Lore) as the pyre. Blanche relates a story about this in The Golden Girls, and it sounds like she's going to say her father stopped the burning, but all he did was say they should start the fire from the bottom. In the Stargate SG-1 episode "The Quest," a platoon of Ori soldiers burns the entire contents of the town library, calling them trappings of an unholy past. The The Borgias episode "The Siege of Forli" features the Bonfire of the Vanities, along with a scene of Savonarola's followers, mostly young boys, going from door to door collecting things to burn and vandalizing houses that don't comply. Machiavelli: I see God is reduced to breaking windows. In The Handmaid's Tale, some workmen are seen burning books and paintings in the city after Offred and Moira escape. "Books Are Burning" by XTC. "Bulls on Parade" by Rage Against the Machine averts this - they don't gotta burn the books, they just remove 'em for similar ends. The opening mini-movie to Styx's Rock Opera 'Kilroy Was Here' featured this, but with records and guitars. "It's The End of the World as We Know It (And I Feel Fine)" by R.E.M. features a reference to burning books in its rapid-fire verses. Played for Laughs in Bloom County, when a self-proclaimed chapter of the Moral Majority turns up at a record store seeking to buy some LPs for a record burning. The cashier doesn't quite understand what they're asking, but manages to make the sale anyway. That Mitchell and Webb Sound: One sketch states this is what Tesco does with all the books it doesn't convince kids to buy. One employee points out, at length, how mean, overcomplicated and pointless the whole affair is, but his co-worker just shrugs him off, and goes back to shoveling several thousand Very Hungry Caterpillars into the furnace. Yes, there is some precedent for this being considered a good thing in The Bible in one specific passage. Note, however, that this is contingent on this being your own profane property you're destroying. Also, it's intended as a show of personal repentance, not wrath at the sins of others, however offensive they may be. This Biblical text was used as justification for publicly burning "Beatles trash" in the Bible Belt in 1966, after John Lennon made his unfortunate remark about the band being Bigger Than Jesus. Parodied by Eric Idle (under Live-Action Films, above). In prior centuries, books condemned by the Catholic Church (plus Protestant denominations) were also burned at times. Thankfully it has gone out of fashion in most cases. In the apocryphal book of 1st Maccabees, scrolls that contained the Law of Moses were forcibly burned, and anyone who was found having them were put to death. In the disclaimer at the front of the modern horror RPG Beyond the Supernatural, Erick Wujcik states that "[i]f anything in this book offends you, please feel free to buy and burn as many copies as you wish. Bulk discounts are available." The page quote above comes from Almansor, a tragic play written in 1823 by German Jewish playwright Heinrich Heine, in reference to the burning of copies of the Islamic holy book, the Qur'an, by the "Catholic monarchs," Ferdinand and Isabella, following the conquest of the Muslim country of Grenada, the final stage of the Reconquista of Spain. And indeed, the words proved prophetic as The Spanish Inquisition (started by those same monarchs around 1480, twelve years before the conquest) was going down at about this time, which would see people being burned at the stake for heresy, and would lead to serious persecution of Jews and Muslims. Following the end of the Second World War, the famous quote from Almansor was engraved on a memorial that was erected at the site of the infamous Nazi book-burnings of 1933 at Berlin's Opernplatz (which is now called Bebelplatz). Almansor was among the many works by Jewish authors that were consigned to the flames — and as we all know, the Nazis didn't stop with just books. Assassin's Creed II had DLC based on Girolamo Savonarola's Bonfire of the Vanities, in which the "Mad Monk," in an effort to return Florence to a Godlier, pre-Renaissance state, organizes massive burnings of the books and artworks that he felt were corrupting Italy. Book burning also went down in the original Assassins Creed. Jubair al-Hakim, Altair's eighth target, blamed written knowledge for pretty much all evils, including the current war between the Saracens and the Crusaders. In his Kick the Dog cutscene, he ends up pushing one of the scholars who protested this into the pile of burning books, telling him that if he loved his books so much, then he could join them. Postal 2 has a level in which the player has to fight their way through throngs of anti-book protesters, who burn down the town library with him in it. In Dragon Age: Origins, one of Wynne's gifts, The Search for the True Prophet, is mentioned as looking as if it had been rescued from a fire at some point. It is interesting to note that the book in question is actually an alternative view of Andraste which was probably quite heretical and blasphemous. In Tropico, you can order these once you have a cathedral built. It wins you favor with the religious crowd and cows the intellectuals into submission to your rule, at the cost of a nasty effect on education. In Tears to Tiara 2, burning of all none-essential and religious books is ordered by the Knight Templar of the The Holy Church. To make the people stupid and prepare them for the Millenarius plan. In Tyranny, Kyros the Overlord's Law includes a ban on any knowledge Kyros deems dangerous. The Sages flouted that Law by hoarding forbidden knowledge in the Vellum Citadel. When Kyros' armies failed to dislodge the Sages through conventional means, Kyros got fed up and responded with a rather extreme example of this trope: they unleashed the Edict of Fire on the Citadel, which reduced the entire region into a blasted hellscape that would continue to burn as long as forbidden knowledge remained within the Citadel's walls. As the Sages managed to make some of that forbidden knowledge fireproof before the Edict started, the whole region is still burning months later when the game begins. In The Elder Scrolls series' backstory, the Alessian Order was a rabidly anti-Elven religious sect which established a Theocracy that wielded nearly as much power as the Emperor at its height. They destroyed any Elven writings or cultural items (especially those of the Ayleids who had previously enslaved mankind) that they could get their hands on. Their success in this regard eventually made it so that only the Imperial account of events surrounding the Alessian Revolt survived. The Order then suffered this as well at the end of the War of Righteousness, which saw their headquarters (along with the libraries and records) destroyed. In The Witcher 3: Wild Hunt, the Church of the Eternal Fire passes ordinances making the use or possession of magic paraphernalia punishable by death. They organize public burnings of books and anyone caught using them. This burning of mages and magick eventually devolves to anyone who doesn't look like a normal human, including dwarves, elves, and other harmless non-humans, being burned alive at the stake. Fable I: It's mentioned that the Heroes' Guild had most copies of "The Guild of Zeroes", a highly uncomplimentary parody play, burned... along with the author. The local schoolteacher is a bit nervous to accept a copy of the book as a gift from the Player Character, who's a member of the Guild. Parodied by xkcd, where some people try this with a Kindle. Bug Martini postulates on how this would work with e-books. The curators of Immortal Library from Girl Genius consider book destruction and mind control the antithesis of everything their odd but powerful little country stands for. In one Penny Arcade strip, Gabe is reading a The Berenstain Bears to his son in which Papa Bear restricts internet access to an hour a day. Gabe, who makes a living off the net and grew up on net culture, is horrified and claims to immediately understand why people would burn books after that. In the video Burning Fifty Shades of Grey by Mr Repzion, Mr. Repzion burns Fifty Shades of Grey, after reading a small portion of it and being disgusted by it. "Welcome to Atop the Fourth Wall, where bad comics burn." Usually Linkara only figuratively burns comic books, but he has done it literally a few times to comics that were especially bad. In one episode, Lisa Simpson sees a bookmobile being driven by Reverend Lovejoy, who asks for book suggestions. Lisa had been depressed at how few people were reading, and excitedly lists some books and authors she loves... then the letters behind a tree reveal that it's a Book-Burning-Mobile. Played for Laughs in another episode, where Bart's method of making a fire holy is to feed it pages of a sacred text. In "Krusty Gets Busted", Reverend Lovejoy holds a public burning of Krusty the Klown merchandise following Krusty's arrest. In the Family Guy episode "Not All Dogs Go to Heaven", Meg takes Brian to the church to burn books on science and evolution, citing them as "harmful to God". Among the burnt books are On the Origin of Species by Charles Darwin, A Brief History of Time by Stephen Hawking, and a fictional book entitled Logic for First Graders. This was the theme and the title of a She-Ra: Princess of Power episode. Avatar: The Last Airbender: The Fire Nation (appropriately enough) broke into the Great Big Library of Everything to burn down an entire section, since it contained information that could harm them. Highlander: The Animated Series had an episode where one of the local Mooks, the green-armored soldiers known as Hunters, decides to quit working for the Big Bad and strike out on his own. He decides the best way to keep the subjects of his new empire in line is to restrict their access to knowledge and develops an obsession with book burning. Ramirez, who had tried and failed to stop the original Library of Alexandria from being destroyed, makes bringing him down a personal crusade. His name, of course, is Hunter 451. The Angry Beavers: In "Beaver Fever", Norb and Dag become disco stars. After announcing their latest album is "bigger than sliced bread", angry bread lovers stage public burnings of their albums. After the beavers clarify that they actually said that their latest album is "bigger than a slice of bread" (Holding up a slice of bread for comparison), sheepish fans are shown trying to retrieve their albums from the bonfire. In The Amazing World of Gumball episode The Blame, Felicity learns that books can be as dangerous as she thought video games were, and her conclusion was to burn all books. In the fourth episode, Bad Kaeloo tosses a bunch of dirty magazines and comic books onto a pile and burns all of them. When the main four go camping in the episode "Let's Play Treasure Hunt", Mr. Cat, who is too lazy to find actual firewood to start a campfire, burns Stumpy's comic books instead.